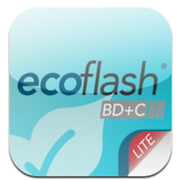 Building on the success of EcoFlash GA, EcoFlash BD+C Lite helps you study for the LEED AP Building Design & Construction exam. With a 50 card sample of the full version's 743 flashcards, EcoFlash is designed to help you study in different ways just like traditional paper flashcards. If you’re ready to start studying, touch “QuickStart” to randomly see 20 of the possible cards. If you’d like to better control what cards you see, tap the Categories menu to see all of the cards at once, to sort them by category, or to sort them by type of question. A unique feature of EcoFlash is Leafmarks – the equivalent of bookmarking certain cards you’d like to return to, but with a cooler name. If you’re having trouble getting a question right and you’d like to set it aside, just tap the leaf in the top right-hand corner. The icon on your home screen will remind you how many cards you’ve leafmarked.